Dwell time and how to increase dwell time are often neglected elements of search engine optimization. You, too, probably mostly concentrate on how to get visitors on your site and rarely give a thought about how to keep them there. However, dwell time, the amount of time visitors spend on your site, is an important indicator. Longer dwell time usually indicates a positive user experience. It’s also something search engines take notice of. For that reason, in this post we will dive into the topic of how to increase dwell time on your WordPress site. For that, we will first examine what dwell time is and why it matters. After that, we will shortly discuss how to measure it and finish the post with some practical advice on how to increase dwell time on your site. What is Dwell Time (And Why Should You Care)? The time between when a user clicks on our search result and when they come back from your website […]. So basically, dwell time is a metric that tells search engines how well you manage to satisfy your visitors needs. If they spend a lot of time on your page, it means they like what they found and your content fulfills what they came to your site for. Since it’s the job of search engines to provide users with the best possible search results, seeing visitors satisfied with your page is a good thing. Consequently, it would be a reason to promote your page in the search results. Conversely, a short duration could be a reason to demote it. While dwell time isn’t an official ranking factor, you would still do well to increase it as much as you can. Why is that? Because a) there are indications that dwell time does influence search rankings and b) taking measures to increase dwell time will improve your general SEO and the quality of your site. And that can never be a bad thing. Before attempting to improve it, you first need to have an idea of how your site is currently faring in terms of dwell time. After all, you can only measure improvements if you have a clear before picture. However, when you check Google Analytics or the analytics tool of your choice, you will be hard pressed to find dwell time displayed anywhere. The only thing Google offers is time on page and bounce rate. Dwell time — As mentioned, this means the time interval between someone clicking on a search result and returning to the search page (and only the search page). Bounce rate — The percentage of people who leave your site after visiting only one page. It doesn’t matter whether they spent two seconds or an hour on there, without a second click both counts as a bounce. Time on page — Means the amount of time people spend on your page before moving on to anywhere else. Their next destination can be the search page, another page on your site or a completely different website. In short, while dwell time is related to bounce rate and time on page, it’s not quite either of them. At the same time, there is no official way to measure dwell time. It’s more of a concept than a hard metric and I recommend reading Neil Patel’s detailed discussion of dwell time. As a consequence, those two metrics are a good way to give you an indication of how your pages’ dwell time is faring. For that reason, before taking any corrective action, you’d do well to note them down for pages that you want to improve. The article cited above also gives you an idea as to what numbers to shoot for. However, the devil is in the details. For that reason, here are some actionable pointers on how to do that. Page loading speed — 40 percent of users will abandon a site that takes longer than three seconds to load. Three seconds? That’s shorter than it takes you to spell bounce rate. Consequently, the first step to increase dwell time on your site is learn how to speed up your WordPress website. Design — Web design has a lot of sway on whether visitors trust your website. That’s why you need to make sure it’s crisp and resonates with your target audience. Simple backgrounds, plenty of white space as well as clear and easy-to-read fonts are your friend. Layout — Design and layout go hand in hand. Make sure your content takes center stage and is easy to consume (more on that below). You can write the best content in the world, if it gives people vertigo trying to read it, they won’t. Mobile optimization — A surefire way to keep your dwell time at zero on mobile devices is to have an unresponsive website. It’s just not acceptable in today’s Internet. So, learn what makes a website mobile friendly today and put it into practice. Ads and popups — While popups can be absolutely essential in building an email list, they can also be annoying as heck. Same for ads. That’s also why Chrome will begin blocking them if they are too intrusive and Google started penalizing ads last year. When using either, make sure they don’t interfere with the user experience. Use exit-intent technology and other ways for more subtelty. Understand your users — The first way to fulfill user intent is to understand what it is. If you can get into your audience’s heads and understand what they are looking for, you’re much better equipped to give it to them. Doing market research for your website will help with that. 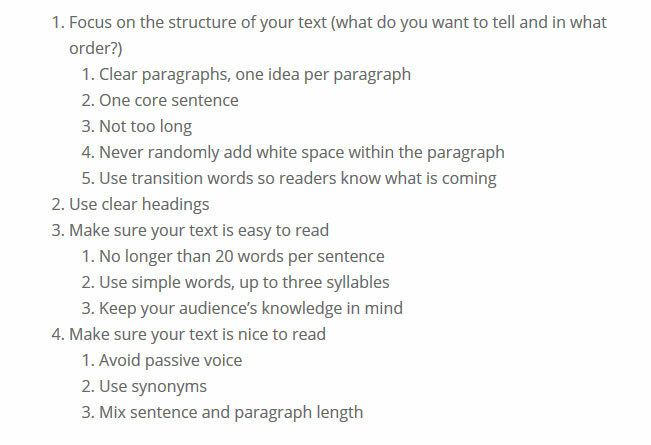 Write longer content — Long-form content outperforms shorter pieces by a long shot. It only makes sense, as longer posts allow you to dive deeper into a topic and answer more of your readers’ questions. Although it’s more work, it also gets results. Target the right keywords — The keywords in your title and description make a promise about what your piece is going to be about. If in the end you don’t deliver on that promise (e.g. an “ultimate guide” that’s only 300 words long), visitors will leave in droves. Consequently, your dwell time will suffer. Don’t do that. Oh, and stay away from clickbait headlines. Keep your content up to date — Stale content is one of the best ways to direct visitors to the back button. There’s nothing more disappointing than clicking through to an article and realizing it’s horribly out of date. I personally rarely even click on search results older than two years. Others will feel the same. Respond to questions and comments — the most important conversation happens in the comment section. If people interact with your articles, the worst you can do is ignore them. Not only do other people read the comments (thus staying on your site longer), when you interact with them, it’s also a reason to come back to your site. Be relatable — People want to connect with other people. Therefore, don’t be afraid to let your personality shine through in your writing. Ask questions, make jokes, be a little silly. It will help others relate to your content on a more personal level and make it more entertaining. Use media — Images, infographics, videos, and other media are great tools to emphasize what you are talking about and break up your content. Plus, with loads of free stock photos out there and the many services for which WordPress supports auto embeds, there’s really no excuse not to use them. Dwell time is not just about the page that people land on. It’s also about the total time they spend on your website. For that reason, in order to keep them around longer, give them somewhere to go next. Linking to related posts on your site (like I am doing in this piece) is one of the ways to achieve that. Another is to include a widget in your sidebar or at the end of your post that lists your latest, popular or related posts. 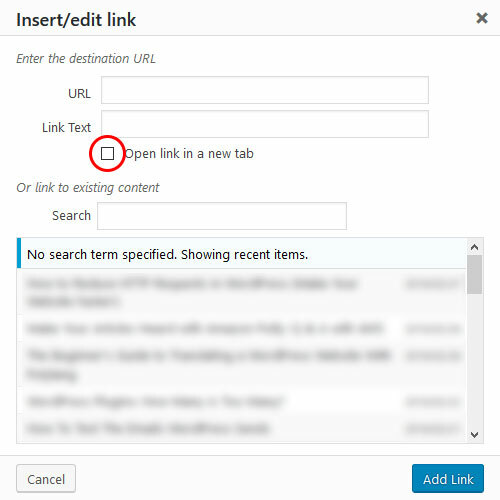 For latest posts, WordPress has a solution built in. Good options for related posts are Jetpack and Related Posts for WordPress. Good popular posts plugins are the aforementioned Jetpack and WordPress Popular Posts. Of course, you should also link to outside sources (where appropriate). However, when you do, make sure to open those links in a new tab or window. It’s counterproductive to try and increase dwell time on your site and then send visitors elsewhere. Dwell time is a much-debated topic in the SEO world. While it has been around as a concept for a long time, a lot of it is still unclear. Among them the question how to measure it reliably and how much weight search engines attribute to it. However, no matter whether Google actually tracks dwell time (they probably do) taking measures to increase it can only help your WordPress site. After all, the time visitors spend on your site before returning to the SERPs is an important quality indicator. Consequently, any measures to increase dwell time will improve your site and your SEO overall. Focus on the two pillars user experience and content. If you do that, dwell time will happen by itself. How do you feel about dwell time as a metric for website success? Any thoughts on how to further increase dwell time on websites? Let us know in the comments section below!